I've rebuild the Dell laptop for my young lady to use as a desktop replacement; it is dual-booting Windows Vista and Ubuntu 12.10. Guess which one she wants? 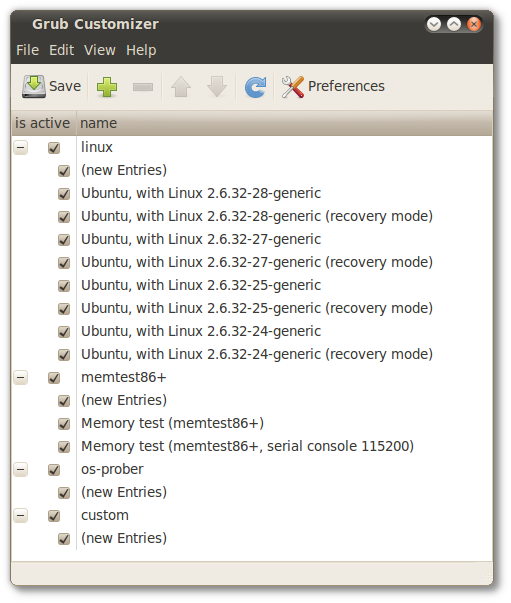 Unfortunately, installing Ubuntu second means it is the default choice at the top of the Grub2 boot menu. If you've tried to edit that Grub2 menu, you'll know what a tricky job it can be. If you haven't - don't. Unless you're a die-hard code-monkey and enjoy the challenge, there is an easier way to alter the order and content of that boo menu. Enter Grub Customizer - A graphical Grub2/BURG configuration application for Linux by Daniel Richter. There is a perfectly good tutorial at How To Geek; How to Configure the Linux Grub2 Boot Menu the Easy Way, complete with illustrations and screenshots, so I won't repeat it. Daniel's graphical tool has made this process easy and straightforward. Installation is simple enough from Daniel's a PPA to make installing the tool quick and easy.Open a terminal window (Ctrl+Alt+T or Applications > Accessories > Terminal) and type in the following commands. However, I just grabbed the latest .deb package directly from the PPA and installed it using Ubuntu Software Centre. Once installed, Grub Customizer will be found in the Applications > System Tools menu. one-click selection of items that show up in the boot menu. one-click selection of entire sections if you don’t want Grub2 to probe for new operating systems, or give you the option to test your computer’s memory. Preferences window lets you customize almost every aspect of Grub - set the default boot menu entry to a certain position, or a specific item. add a background image and customize text colors.